Sullivan County, New York and its county seat of Monticello, New York has some of the loveliest homes and historic commercial buildings in the state, but appearances can be deceiving. Any home or commercial building erected before 1978 very likely contains asbestos and asbestos causes life-threatening illnesses like cancer, Mesothelioma and Asbestosis. Our company can help as we have been providing asbestos abatement and remediation in Sullivan County and Monticello for two decades. Where did all the asbestos come from? 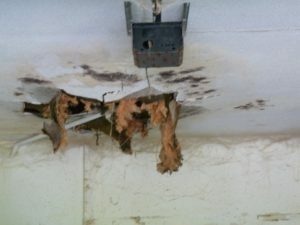 Once considered the perfect building material as it was both strong and fire-resistant, asbestos found its way into insulation and siding, asbestos plaster and sheetrock, asbestos floor tiles and roof shingles and, most commonly, those “popcorn” ceilings so popular in basement rec rooms and above office cubicles. When the materials degrade with age, they release deadly asbestos fibers. We send in a third-party testing firm to sample the air and, if asbestos is detected, our certified, licensed and insured crew is sent in. They use all their extensive training and experience to set up a decontamination zone and use negative air machines to ensure that no more asbestos escapes into the air during abatement. The asbestos is carefully chipped off and disposed of off-site. During remediation, all exposed areas are sealed and the zone completely cleaned with specialized filtering equipment. Then the air is retested and, only when no asbestos is present, do we sign off on the job and allow your employees or family back into the building we now have made safe. Asbestos consultation is free and available in Sullivan County, NY and Monticello, NY by calling call (877) 645-1428.